We made Marie Curie, the genius scientist who has lived most of her life in Paris, the eponym of this elegant and smooth Fountain Pen. 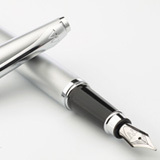 The Gusswerk Marie Curie Fountain Pen is intentionally made lighter than the other models of our explorer-series and stands out due to its slim alignment, making it the perfect model for women as well as a reliable and timeless writing utensil. We recommend using the Marie Curie Fountain Pen with the original Gusswerk Converter, but it can also be used with standard sized ink cartridges. This model can be used with our ink converter small as well as with standard ink cartridges. Initial filling instruction when used with the ink converter are available as pdf in the download section.